“Catholic education addresses the search for meaning, this desire of the person to understand human life as an integration of body, mind, and spirit… Catholic education fosters the search for meaning as a lifelong spiritual and academic quest.” (Institute of Catholic Education, 2011). The Kindergarten program reflects the belief that four and five-year-olds are capable and active learners, full of potential and ready to take ownership of their learning. 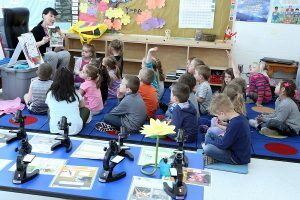 Based on self-directed learning with a child-centred approach, Kindergarten students learn through play-based experiences that promote emotional, social, cognitive and physical development in an environment which is safe and comfortable for all children. Children are encouraged to explore their interests and are encouraged to learn based on their lead. This allows for more excitement in learning; more joy, more wonder, and more learning. The key areas of student learning are divided into four frames, which are designed to support planning instruction and assessment that aligns with how learning naturally occurs through play and inquiry. The four frames include: belonging and contributing, self-regulation and well-being, literacy and mathematics behaviours, and problem solving and innovating. The program supports the belief that learning happens in a relationship setting, when kids are partnered with other learners. Literacy and numeracy are skills that happen naturally when educators lay the foundation for other skills.